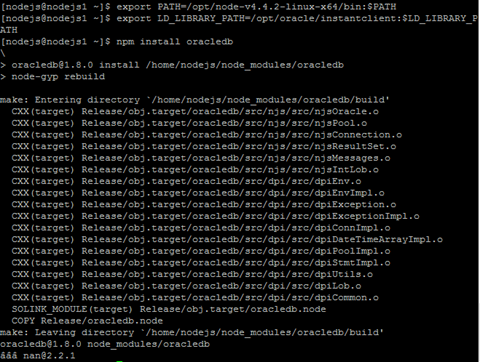 As described in that article, the node-oracldb module is depending on the Oracle 11.2 or 12.1 client libraries. So you need to install a full Oracle client, local database or the Oracle Instant Client. I will be using the Oracle Instant Client since it is small and easy to install. As of Node.js 4 the compiler must support C++11. This is not included in the default compiler on Linux 6. You can either install another compiler or use Linux 7. In this article I will be using the following setup. 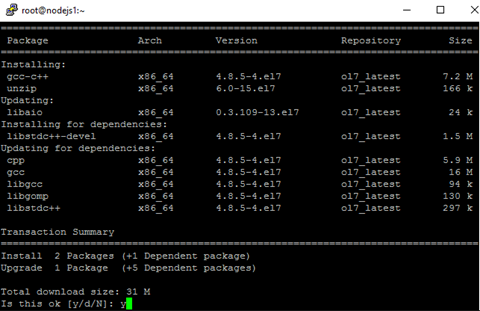 Use yum to install the OS prerequisites. On another VM, I have an Oracle Database 12.1.0.2.0 pluggable database running. Put the files in the /tmp directory of the VM using any sftp tool you like. We will remove them when we are done. If you install the Oracle Instant Client in another location, you will have to set two environment variables, OCI_LIB_DIR and OCI_INC_DIR before installing th oracledb module. See INSTALL.md on Github for more details about this. You can choose to install the module local to the user of global for the system. If you install it local to the user, you don’t need to be a privileged user. You can choose any user you need to run Node.js. Download dbconfig.js and select1.js for a test of a db connection. You can either change the dbconfig.js to match you db connection or set some environment variables. This will perform a simple query on the departments table from the HR sample schema. Set the environment variables permanent. You can set the environment variables permanently for either the specific user or system wide. Place them in the .bash_profile of the user that will run Node.js or create a .sh file in /etc/profile.d so the environment variables are set at logon for every user. Install oracledb module global and set additional environment variable. Set the environment variable NODE_PATH so Node.js knows where to find the modules. Works in RHEL7. Thanks a lot. if I want to connect to remote oracle db then what would be the connection string on client side? ZIPs definitely have a role. 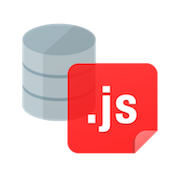 I’m looking forward to seeing more great posts on node-oracledb from AMIS. It’s great to see clear steps with screenshots. Personally I find the Instant Client RPMs are easier to use on Linux unless you are going to install Instant Client in a location relative to some working directory, which wasn’t the case here since you installed in /opt/oracle. The node-oracledb installer search path checks the RPM location (see https://github.com/oracle/node-oracledb/blob/master/INSTALL.md#-oracle-client-location-heuristic-on-linux) and will also use RPATH when linking, so you don’t need to set LD_LIBRARY_PATH at runtime. You are right about that. rpm’s are easier when you want to install in the default location. I know some customers that want to install it iin their custom location. That’s where the zip files come in handy.